How many of you guys actually use light meters? And if you don't mind, can you share with us what light meter you use and why you chose that specific light meter? I'm interested in purchasing one so I can keep my lighting ratios consistent on my wide, mid and close up shots. I'm considering the sekonic L-758 cine. Is there a different one I should consider? Should I consider purchasing a light meter at all? Thanks for any feedback this post may get. I never leave home without mine (or my spectrometer most days, thanks LEDs!). I'm utterly reliant on it for my lighting and ratios. I have the L-758 Cine, but wouldn't personally recommend it, as I find the user-interface utterly incomprehensible, baffling in it's complexity and far slower to work with than it should be - it's possibly the most unintuitively designed piece of equipment I've ever owned. But I do like the simplicity of having both my incident and spot meters combined. Possibly Sekonic's latest one (I think it's called a 'L858' or something like that) will be more intuitive with it's LCD screen (though I suspect battery life will become a much bigger consideration. (though I suspect battery life will become a much bigger consideration. Can you charge it using a power bank? Light meter ergonomics is a personal thing. For me the 758 is very easy and comfortable to use. The EI/fps/T-stop readout in the viewfinder is brilliant (not all the meters have it), makes spot metering much easier. That "delta-EV" function also helps to work faster. I won't ever buy a meter with a backlit a-la smartphone LCD - harder to read outdoors and power hungry. I've used a light meter for years, mostly a spotmeter. However, when I moved into making moving pictures many of the descriptions for lighting and proper exposure, were in terms of footcandles, I bought a 'cheap' Sekonic incident meter, L-308 DC, which had 'cine' features and footcandle readings. For 'ratios' I use the spotmeter, for basic light levels I use the the Sekonic. I believe the 758 has a 'spot' and 'incident/reflective' modes. And had I the bux, probably would have bought that. I have a 758C and a Studio Deluxe iiA as a backup (no batteries woot!) and I"d never leave home without it. I used to carry a Minolta Color Meter but not useful anymore with LEDs really, so I have to upgrade. I also used to love my Minolta IvF meter back in the day but it gave that away to a buddy of mine. And yes i still use them. Maybe not as much since I can see whats going on with my eyes most of the time; but still useful. I still shoot on film (stills and motion), so I own several light meters. It would be difficult to shoot without one. For still photography, I normally use the spot meter function when the subject is distant and it is essentially two-dimensional as far as the camera is concerned (landscapes, still lifes, architecture, abstracts). For cine work, I usually use incident metering, where people moving through the light and subjects near the lens are more important. Incident also works better for pre-lighting and adjusting lamps to the same intensity. I use my meters for digital shoots rarely, and almost exclusively to read footcandles when lighting a set. So if I were to buy one now, it would have to include that function. The digital camera you are shooting with is usually a better reflective meter than the spot meter since you can immediately see how dark or bright certain areas are on the monitor and adjust accordingly. 1. Sekonic L-508 - my first meter. It has served me well for about 17 years and still works fine. Combined spot and incident, runs on a single AA, no footcandle readout. I really wanted the L-508C (Cine) model but couldn't afford it as a student at the time. It's really just a backup now, as it's getting old and sometimes doesn't power on. 2. Spectra Cine IV-A - the industry standard incident meter which reads in both stops and footcandles. I got this maybe 5 years ago when I moved on from AC work to shooting full time and started pre-lighting sets more. There's no spot meter function (unless you buy an expensive attachment), but it is very accurate, small, and very lightweight. This is the meter that is always in my bag. Takes an oddball PX28 lithium battery, so I also keep a spare in the meter case. 3. Sekonic L-558C. The previous model to the L-758C. I just got this recently as I was debating whether to get a dedicated spot meter or not. This one ended up being more sensitive and more accurate than the other models, and I was able to get it for a steal on ebay. The spot meter function is much improved over my L-508, being a true 1 degree spot, less prone to flare, and with a digital readout in the eyepiece. The meter also reads footcandles, so I have a backup for that too now. My only issue with it is the size - it's much bigger and more awkward to use than the older meters. So it generally stays at home unless I need it. Takes a lithium CR123 battery. No love for the L-398a Studio Delux III ? Depends how abused it is. My 398a (thanks for reminding me the name) is always just about dead on with every other meter i've tested it on, and i've had it maybe 6 years. I don't pull it out too often, of course, because it's a backup; but ill often give it to a gaffer if he hasn't got his for whatever reason, and provided he knows how to use the damned thing. I also often take it out on location scouts, since it's smaller. Thanks for the feedback guys! I'm considering the L-758 cine or the new L-858d. People buy light meters and keep them for 10+ years, so my only issue is how well will the touch-screen on the 858 hold up.? It seems to be a more light sensitive meter and was designed with digital cinema cameras in mind, and it's a little cheaper. But will it hold up for the long haul? Or what if it's accidentally dropped, will the screen crack easily? Will the screen touch sensitivity die out over time? These are the questions I'm asking myself. When I buy a light meter I want one that I can learn the ins and outs of, and it becomes second nature for me to use. And I want one that I can get 17 years out of like Satsuki Murashige. Sekonic just release the promo video for the 585d the other day and it looks promising...But long term use is what's questionable. Do you guys think it will hold up for the long haul? And the new video is below. It looks like the touch screen is basically the same as the incident meter-only L-478 which has been out for a few years now. I haven't heard of any issues with it, so I'm guessing it's fine? My concern would be the backlit touch screen messing with the incident exposure readings in extreme low light situations. 13 million ISO?? I dunno, seems to me that a calibrated monitor would be a better tool at that point. I haven't ever used the whiz-bang features in my meters. I just need to know what my ratio is, and how much light there is here or there. Looks cool, sure, but yeah, Don't really see how this is soo much better than whats around now and I don't want more LCD screens around (plus won't work in gloves to touch the thing and might not be as responsive in cold). That 858 does look like it has a much more intuitive interface. I'd have serious concerns about the impact of the LCD screen on measurements though, especially since the meter is so sensitive. For me, the big question is how much easier it is to dial in exposure compensation compared to the 758c. If it's as comparatively easy as the rest of the interface is, that could actually inspire me to swap over. Also, how quickly does the thing boot up? My C700 takes a painfully long time to boot, and gets used less because of that. A wait time is basically unacceptable for a lightmeter though. Any ideas why the price point of the 858 would be lower than the 758? It's newer technology and supposedly more sophisticated, but why the lower cost? Sorry I'm asking all these questions, but I'm not familiar with light meters and I don't understand or know where they cut cost so they can charge a lower price. And Mark, I downloaded the user manual for the 858 and it says there's a 1 second boot up time. Maybe fewer people are buying light meters these days, and they need to drop the price to sell them in the same quantity? They also probably save some money on components like dials and switches by having everything on a touch screen. that's 1 second too long. Honestly, I don't see the point of using a light meter for shooting digital in such extreme low-light situations as shown in the Sekonic demo video. Since light intensity is logarithmic, the difference of 1 stop under/overexposed at 1 footcandle is 0.5 and 2fc. If you angle the dome on the meter a few degrees one way or another, you'll get a bigger range of readings than that. So you're much better off just checking the monitor and a waveform to see what you're actually getting on camera. It makes a lot more sense to use a meter when you're working around 10-100fc, where the chance for error from measuring off-axis is less likely. I have a Minolta Autometer VF. Great incident meter. 1 AA battery. Today's reincarnation is the Kenko KFM-1100. As for combined meters i like the Minolta VI, Kenko KFM-2100 and the update KFM-2200. All running on 1 AA battery. The 2200 has some extra functions, slight change in analog scale and illuminated screen. The one thing i miss on these combined meters is the absence of dedicated EV button. I still find convenient from analogue meters reading the light in EV values and determining the difference. They have EV reading option but is in the ALT menu. As of the L-398A, i had a fetish for it a loong time. i find it's usability quite limited. Alexa with 800ISO, 25fps, and T2.0 is ~7 foot candles. The needle would be near the bottom of the meter scale. Sure, you're not always @7fc for a T2 (we has ND afterall so I'll often do some maths lol. I like it just as a backup and you can pry it from my cold dead hands). I use my meters for digital shoots rarely, and almost exclusively to read footcandles when lighting a set. So if I were to buy one now, it would have to include that function. I agree, a meter that reads foot-candles is indispensible because it enables you to set levels and balance your fixtures in advance. Like a game of 3-D chess, a DP can light an entire scene in his head using his mind’s eye. As a starting you need to choose the exposure of the key tone at the outset - say T5.6 for deep focus. Having chosen the exposure you can then calculate how many Foot Candles (FC) you need on different elements of the scene. Put all the scrims back in and now, using single and double nets, systematically under expose the flesh tone in half stop increments (remember rotating a net relative to the light source will make it "fatter" or "thinner", which will enable you to "dial in" the exact level you want from the light.) If you want to play on the lower register continue to under expose the flesh tone until it becomes a pure silhouette. Do the same for Fill, Back Light, Kickers, Hair Lights, and Liners in isolation and in specific combinations that you plan to use them. Having systematically tested each light, you can now see the effect that different ratios of each has on the scene and can even use the test as a reference on set when lighting the scene. An example of this type of pre-visualization would be say you are shooting a couple conversing at a bar. After working through in your minds eye that you want a low-key look with selective (shallow) focus you might settle on a stop of 2.8. Say the script calls for the guy to be somewhat mysterious and distant and the women to be very open and receptive, then you may choose to keep him in deep shadow with just enough of a liner to separate him from the subdued background of the bar. 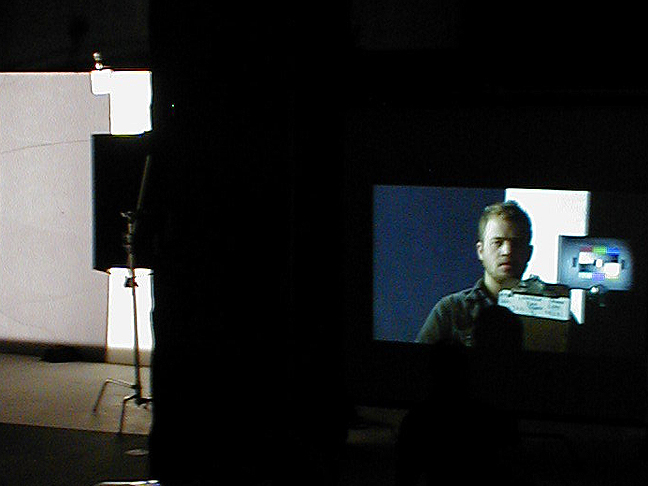 This type of lighting on him could be motivated by a practical fixture you establish behind him, which would be consistent with the more frontal key you want for her, since you would want to light her more frontally so that her character is clearly apparent, but not him to retain some mystery to his character. Having roughed out your style and light placement you can begin to set your levels and balance your lights based on lighting tests you have shot over the years. For instance, if your camera is two stops faster than an ISO 100 film, you will need 24 FC to properly expose your key tone (mid gray) at a T Stop of 2.8. 24 FC would then give you a “properly” exposed flesh tone on her. But this is a bar with subdued lighting, so you don’t want full exposure on her. You liked the feel of a half key (1 stop under) in your lighting tests so you would light her with 12 FC from a high frontal key. Again, because the scene takes place in the subdued lighting of a bar, you don’t want to over fill her. 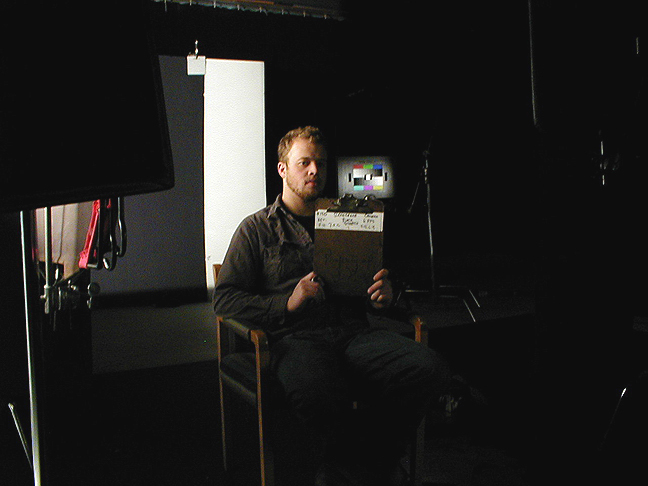 Going back to your lighting tests you like the look and feel of an 4:1 key to fill ratio so you would give no more than 3FC of fill light. You need to separate her from the dark background of the bar and so you might give her a backlight of 6 FC because that's what looked appropriate in the lighting tests to separate her hair color from a dark background without looking over-lit. You would want to make sure you flag her back-light off him since you want to play him in near silhouette and so have to keep any frontal light on him to under 1 FC because four stops under exposure was a near silhouette with just the right amount of detail in the lighting test. For the liner to separate him from the dark background of the bar you will need a fairly strong fixture capable of delivering 48FC from directly behind him since your lighting tests established you need to be at least a stop over exposure for the liner to read. Once you have figured out how many FC you need for the effect (a liner in this case) you can figure out which lights will give you that using the photo-metrics that manufacturers provide on their websites, or you can download Arri’s handy photometric calculator (be wary of the photo-metrics given for LED lights.) With a little experience you begin to develop a feel what light will give you what you need in different situations. You wouldn’t want to try to use the practical fixture that you are flying in behind him to motivate this lighting scheme as the source for the liner on him because, first of all it’s placement in the shot may not be far enough around his back to serve as a liner. But, also to deliver 48 FC on him, it would be screaming hot in the shot. For this reason it is better to use a separate light to light your talent and treat the practical so that it looks realistic in the shot. I find that practical lamps never look convincing unless one treats the lampshade as well as boost the bulb wattage. Unless it is completely opaque, you typically need to treat the shade to keep it from burning out (remember stopping down to keep it from blowing out will throw off the balance you have set with your other lights) You can put a lower wattage lamp in it, but then the output of the practical on the bar will look rather anemic. I find you get a more realistic look if you boost the wattage of the bulb and line the inside of the shade with ND gel. It is a delicate balance to achieve. You can achieve this balance without a monitor, by using the old school method with incident and spot meters and a selection of practical bulbs including PH 211, 212, and 213 bulbs. Years ago Walter Lassaley, BSC, instructed me to balance practical’s such that an incident reading of the direct output one foot away from the bulb is one stop over exposure which in this case would be 48 FC. I have found that rule of thumb gives a realistic output to the practical. After establishing the practical’s output using an incident meter, you then use a spot meter to determine how dense an ND gel is needed to line the inside of the glass shade. You can do all of this pre-visualization, setting of levels, and balancing based upon a location scout, blocking with stand-ins, and your lighting tests. In other words, almost everything can be worked out ahead of time so that when you arrive on set you know exactly what you need to do. 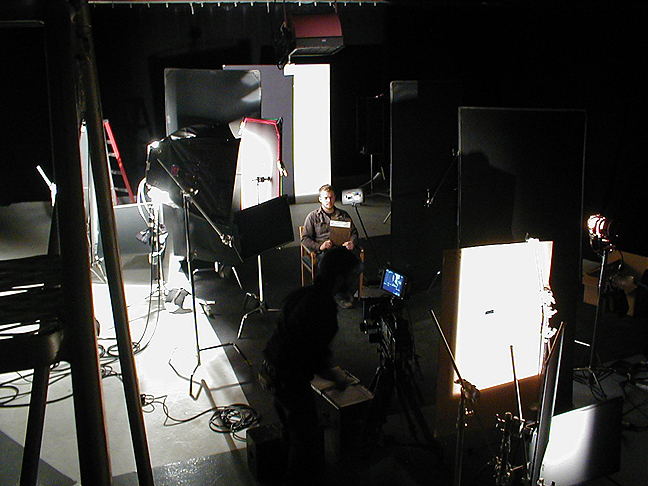 This is especially helpful on low budget projects since, generally the time spent with minimal crew in scouting and blocking with stand-ins, is considerably less than the time wasted working these things out on set with a large crew and principle talent. I have a Minolta IV F that I've had since film school, and a Minolta spotmeter that I bought about 10 years ago. I rarely use either of them anymore. I sometimes use the incident meter when shooting day/ext, but generally I rely on my monitor to judge exposure. Guy Holt thanks for such a good write up!